Stephen Curry scored 29 points in 25 minutes before sustaining a sprained MCL in his left knee as the Golden State Warriors beat the Atlanta Hawks 106-94 Friday in Oakland, Calif.
Curry, making a comeback from a sprained right ankle that forced him to miss the previous six games, got rolled up on by falling teammate JaVale McGee in a third-quarter collision near the Atlanta basket. In obvious pain, Curry limped to the bench and subsequently to the locker room, and was quickly ruled out for the remainder of the game. He will undergo an MRI exam Saturday, the Warriors announced. Nick Young scored 24 points for Golden State, which was without injured All-Stars Kevin Durant, Draymond Green and Klay Thompson. Taurean Prince led the Hawks with 20 points. Marcus Morris scored 30 points as Boston rallied from a 12-point deficit to pull out a win at Portland. Terry Rozier added 16 points for the Celtics, who outscored Portland 38-23 in the fourth quarter. Damian Lillard and CJ McCollum each scored 26 points for the Trail Blazers, who lost their second straight game following a 13-game win streak. Al-Farouq Aminu collected 16 points and 10 rebounds for Portland. 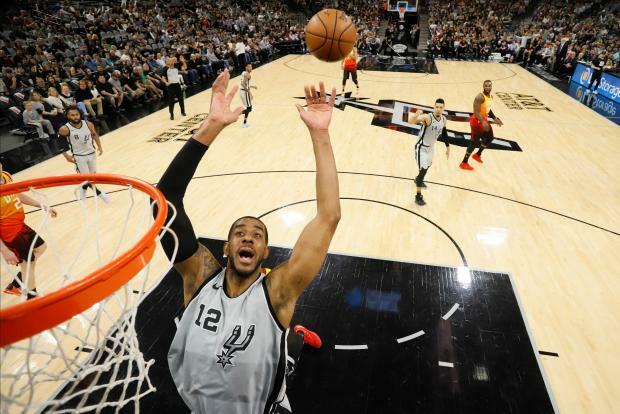 LaMarcus Aldridge poured in a career-high 45 points, including 28 in the first half, as San Antonio defeated visiting Utah in overtime in a game with huge playoff implications. Donovan Mitchell's 3-pointer for Utah with 3.6 seconds to play in regulation capped a furious final two minutes of the fourth quarter and sent the game into overtime tied at 114. The victory was the Spurs' season-best sixth in a row. San Antonio is tied with New Orleans for fifth place in the Western Conference a game behind fourth-place Oklahoma City with nine games to play. The Jazz hold a one-game edge over Denver for eight place in the West. Kyle Lowry had 25 points, 12 assists and 10 rebounds and Jonas Valanciunas added 23 points and eight rebounds to help Toronto rally over visiting Brooklyn. DeMar DeRozan scored 21 points, Fred VanVleet added 16, Pascal Siakam contributed 11 points and eight rebounds and Serge Ibaka scored 10 points for the Raptors. D'Angelo Russell had 18 points, 13 assists and 11 rebounds for his first career triple-double, Rondae Hollis-Jefferson had 18 points and seven rebounds and Allen Crabbe scored 18 points for the Nets. Russell Westbrook scored 17 points in the fourth quarter as Oklahoma City rallied to beat visiting Miami. The Heat led 71-66 with 10:06 remaining in the fourth quarter, but the Thunder went on a 10-0 run to take command on the way to their seventh win in eight games. Westbrook led the Thunder with a game-high 29 points, 13 rebounds and eight assists. Steven Adams had 24 points and 12 rebounds. James Johnson led the Heat with 23 points, and Goran Dragic had 20. Bojan Bogdanovic scored 28 points on 12-of-18 shooting to lead Indiana over Los Angeles, the 13th time Bogdanovic scored 20 or more points this season. He averaged 6.8 points in the previous five games. Indiana's Thaddeus Young delivered 16 points and 10 rebounds, and Victor Oladipo added 18 points despite a 4-of-16 shooting effort. The Pacers' magic number for clinching a playoff spot is one. Lou Williams led the Clippers with 25 points on 10-of-18 shooting. Tobias Harris scored 18 points for Los Angeles, and DeAndre Jordan added 14 points and 11 rebounds. Nikola Jokic and Jamal Murray each scored 25 points to lead Denver to victory host Washington. Will Barton added 22 points for the Nuggets, who are looking to end a four-year playoff drought. Bradley Beal had 24 points and Markieff Morris scored 17 for Washington. Nuggets leading scorer Gary Harris missed his fourth consecutive game with a right knee injury. JR Smith hit consecutive 3-pointers during a 20-2, second-quarter flurry that sent Cleveland to a home victory over Phoenix. LeBron James had a game-high 27 points in just 29 minutes as the Cavaliers won their fourth straight game while sending the Suns to their 10th consecutive defeat. Troy Daniels had a team-high 20 points for the Suns, who remained tied with Memphis for the fewest wins in the NBA with 19. Karl-Anthony Towns had 24 points and 13 rebounds and Andrew Wiggins added 17 points and 11 rebounds to lead Minnesota over host New York. Tim Hardaway Jr. had 39 points and Trey Burke added 15 points off the bench to lead the Knicks, who lost their second consecutive game. Shabazz Muhammad scored a season-high 21 points as Milwaukee's bench provided the offensive spark in an easy victory over host Chicago. Milwaukee was playing without forward Giannis Antetokounmpo, who sprained his right foot in a loss to the Los Angeles Clippers on Wednesday night. In the absence of Antetokounmpo, the league's fourth-leading scorer, Khris Middleton and Eric Bledsoe helped pick up the slack, combining for 29 points. Denzel Valentine topped the Bulls with 20 points.